All my life I’ve been a troubadour. When I was twelve, I found a 4-string banjo in the attic, a memento from my father’s college days. He said I could try to play it, I invented a way to tune it that wasn’t actually the right way, and within a year I was earning nearly tens of dollars a month playing that banjo. This was during the height of the great folk music pandemic in the 1960s, and anyone with an instrument could find someone willing to listen. Over the years, the banjo and I have had a very cordial relationship, I flirted with the mandolin for a long time, but I fell head over heels in love with the guitar. Ever since those teenage folkie days, all I have ever wanted to do is to communicate through music and to help others to connect with the music more deeply as participants and listeners. My professional life onstage has been spent in the worlds of folk and bluegrass, opera, jazz, symphony, and musical theater, but primarily in classical music. Behind the scenes, I’m an author, lecturer, translator, and book publisher. But no matter what I do, the central thread of my work is a combination of the three things that really light me up: music, historical research, and storytelling. I enjoy exploring the origin and original context of musical works of all kinds—when did it become popular, who created it or first wrote it down, what else did they write, what was the world like at that time, why was this particular piece created, where it was first performed, what did people think of it, and what can we learn from it today? In a wonderful way, questions like these always lead to more questions, and the answers can lead to surprising and fun connections with things we already know. Songs and facts come to life in a new way. These discoveries expand our horizons, and give us a deeper understanding of our own heritage and our place in the continuum of human history. After emigrating to the West Coast toward the end of the last century, I became fascinated with the era of the Great Migration to California and Oregon between 1840 and the 1880s. The journey to the Western States in those days was grueling and hazardous, and people made the trip for all sorts of reasons. During their journey, they sang favorite songs and wrote their own—to entertain, console, uplift, calm, and energize themselves. After they got where they were going, music continued to be a part of their lives, and the booming music publishing industry blanketed the USA with sheet music. Go to the resources page for links to examples. Music was an absolutely integral part of life in mid-19th century America. In those days people made their own music -- most of the live music you heard was music that you were somehow involved with: a dance with a fiddle; an upright piano or pump organ at home; a guitar or banjo; or unaccompanied voices joined together in a hymn or an familiar song. 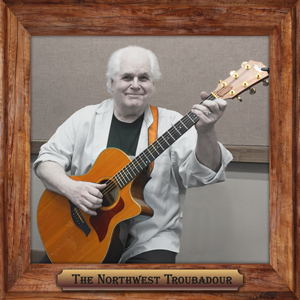 Throughout its four seasons, the Northwest Troubadour series has focussed on songs that were popular in the USA between 1840 and the 1890s, songs that were actually sung and heard by Americans: in their homes, in saloons, on city streets, on the Oregon Trail, travelling the great rivers, gold mining in the mountains, surviving the civil war, and settling the Western Territories. Music and songs were everywhere. Through music, history speaks to us, and stories come to life.